Twelve-month survival curves for the hazard rate of relapse (Mantel-Cox χ21=10.47, P=.001) and the hazard rate of exiting (Mantel-Cox χ21=6.58, P=.01) in the treatment maintenance (n=29) and discontinuation (n=27) groups. Fyer ALiebowitz MSaoud JDavies SKlein D Discontinuation of alprazolam and imipramine in panic patients. Presented at: New Clinical Drug Evaluation Unit Program 34th Annual Meeting May 31, 1994 Marco Island, Fla.
Background There has been little systematic work done regarding the long-term treatment of panic disorders. The aim of the present study was to assess the 12-month cumulative risk of relapse specifically due to discontinuation of imipramine and to test the hypothesis that maintenance treatment with imipramine protects patients with panic disorder and agoraphobia from such reversals. Method Following an acute-phase open trial with imipramine (2.25 mg/kg per day) involving 110 patients for 6 months, the 56 patients who were in stable remission, did not require additional treatment, and consented to be randomly assigned to double-blind maintenance (n=29) or discontinuation (n=27) conditions were followed up with planned assessments every 2 months during a 1-year period. There were no behaviorally oriented interventions or instructions at any time during the 18 months of the study. Results Maintenance treatment (1 relapse) and discontinuation (10 relapses) conditions had significantly different survival curves (Mantel-Cox statistic χ21=10.47, P=.001). None of the additional 10 variables from demographic, clinical, and open-treatment domains considered in the proportional hazard model disrupted the significant relationship between experimental drug condition and relapse; other things being equal, a patient receiving imipramine maintenance was 92.5% lower in the hazard rate of relapse than a patient receiving placebo. Conclusion The results confirm the very high degree of prophylactic effectiveness of maintenance imipramine treatment and demonstrate that relapse, although substantial, occurs in a minority of patients with panic disorder and agoraphobia who are in stable remission prior to treatment discontinuation. DESPITE THE impressive advances made in the acute-phase treatment of panic disorders with antidepressant medications, there has been little systematic work done regarding long-term treatment.1 Naturalistic follow-up studies reveal an alarming degree of trial and error in clinical practice, as evidenced by frequent stopping and resuming of antidepressant medications.2,3 They also report a disappointingly low proportion of remitted patients, one third of whom subsequently relapse within a 12-month period despite being exposed to pharmacological and/or psychological treatment.4 Long-term controlled treatment studies are required to provide empirically based, valid practice guidelines in this area. The question of relapse, and the intimately related issue of the need for and the effectiveness of maintenance treatment, is primarily relevant to patients with panic disorder who have shown marked response to acute and continuation treatment with antidepressants. Six recent studies have looked at relapse in treatment responders.5-10 Relapse following open discontinuation of imipramine treatment was reported to be 46% within 2 months in one study8 and 18% within 5 months in another.6 Relapse during 10 weeks of single-blind placebo substitution was reported to be 45.5% and 64.7% for imipramine and clomipramine, respectively.7 Double-blind, randomized studies have reported significant findings, with 38% and 30% relapse rates within 3 months of placebo substitution for imipramine5 and paroxetine,9 respectively, and a null finding (8% relapse) within 6 months of placebo substitution for fluoxetine.10 Only the last 2 studies used adequate sample sizes. Regarding maintenance therapy, the double-blind studies cited and systematic open maintenance studies with phenelzine11 and imipramine5 show an impressive stability of improvement and response over 6 to 12 months of maintenance treatment with these drugs. Unfortunately, the specificity of their prophylactic effect cannot be ascertained with confidence from these studies, and the only controlled study covering a risk period for relapse longer than 3 months found no significant differences between fluoxetine maintenance and placebo substitution.10 Herein, we present a controlled, 12-month maintenance/discontinuation study in patients with panic disorder and agoraphobia who initially showed good and stable response to imipramine treatment. The major aim of the study was to assess the extent of relapse due specifically to discontinuation of imipramine and to test the hypothesis that maintenance treatment protects from such reversals. Study design consisted of 24 weeks of open treatment with imipramine followed by a 12-month controlled discontinuation/maintenance phase for those patients who met operationalized response criteria at both the 16- and 24-week assessments. The selection of the original sample of 110 patients with panic disorder and agoraphobia who started open treatment; the procedure of administering 4 identical-looking tablets throughout the study that were composed of either 10 mg, 25 mg, 50 mg, or 75 mg of imipramine or placebo; the rationale for the target, stable dose of 2.25 mg/kg per day; and the characterization of treatment response have been described in a previous publication.12 Briefly, all subjects gave informed consent for both the open and placebo-controlled experimental phases of the study. They were selected from the pool of patients, aged 18 to 65 years, who contacted the Phobia and Anxiety Disorders Clinic, The Ohio State University Medical Center, Columbus, either through clinical referrals or in response to media coverage or advertisement. In addition to meeting Structured Clinical Interview DSM-III-R13 diagnostic criteria for panic disorder with agoraphobia of at least moderate severity and 3 months' duration, patients must have been experiencing active, recurrent panic attacks at the time of initial evaluation. Additionally, fear of panicking or losing control must have been the primary motivation for their escape or avoidance behaviors. 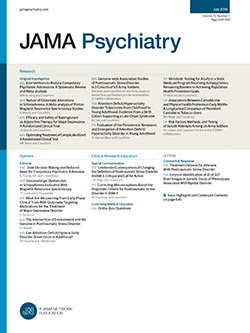 Exclusion criteria included evidence of organic mental disorders; psychotic, bipolar, and obsessive-compulsive disorders; primary or current major depression with melancholia; and suicidal intention or a score of 18 or higher on the 17-item Hamilton Depression Rating Scale.14 Other exclusionary criteria included posttraumatic stress disorder, somatization disorder, severe personality disorders (borderline, schizotypal), and substance abuse disorder (current or in remission for <6 months). In addition, patients had to be in good general health, have no contraindications for the use of imipramine because of illness or because of treatment necessary for the illness, and demonstrate compliance during an initial, 2-week, single-blind placebo run-in. Finally, although the expectation was to have patients free of all psychotropic drugs for 14 days before treatment began, an exception was made in the case of patients who were unable to stop using benzodiazepines initially. This was done with the understanding that these drugs, administered by research personnel, should be taken on a regular, not as needed, basis and that they would be tapered off gradually, starting at week 4 of open imipramine treatment and completely discontinued by the week 16 assessment, to qualify for randomization to the maintenance study. No additional treatments, in particular no encouragement or instructions for self-directed exposure to phobic situations or other coping strategies, were given during the open phase of the study. Patients identified as nonresponders at week 16 were dropped from the study and offered alternative, clinically appropriate treatment. Participation in all treatment phases of the study was free. Of the 110 patients who started receiving imipramine, 77 completed week 8, 66 completed week 16, and 59 (53%) went on to week 24 in stable remission. Of the 33 patients who dropped out before week 8, 6 because of noncompliance and 27 because of typical imipramine side effects. Of the 18 patients who dropped out after week 8, 3 dropped out because of adverse effects, 6 because of noncompliance, and 9 because of failure to show good response by week 16 of treatment. Three patients were not randomized to the experimental phase; one because he was still receiving benzodiazepines at week 16, another because of her desire to become pregnant, and the third because of noncompliance. Thus, 56 patients were randomly assigned to either imipramine maintenance (n=29) or placebo discontinuation (n=27), and they constitute the sample for this article. The demographic, comorbidity, clinical, and acute treatment variables of this experimental sample (Table 1) are representative of the original sample of 110 patients. No significant differences on these variables or on measures of psychopathology at pretreatment were found between completers and noncompleters of acute-phase treatment. The degree of improvement in the completers is fully characterized elsewhere,12 and is accurately represented by the levels of symptom severity at pretreatment and remission, as presented in Table 2. Patients were not allowed to obtain any psychiatric or psychological treatment outside of the study, but were encouraged to call the clinic for any problems that they had. At these times, they were seen and the complete battery of assessments, including plasma levels, was administered. At no time during this study were behavioral or cognitive instructions or interventions that specifically addressed panic or agoraphobia provided. However, brief, 1- to 2-session, crisis-type interventions were provided as needed. Only when treatment with antidepressants became specifically indicated, such as in the case of relapse or clinically severe depression as evidenced by a Hamilton Depression Rating Scale score of 18 or higher, or when medical conditions developed contraindicating the continued use of tricyclics, were patients taken out of the study and appropriate action taken based on their clinical needs. In the case of relapse, patients knew in advance that they would be retreated with the same medication. In the present context, the outcome categories of response and relapse that were used in the survival analytical procedures are of primary interest. The 7 key measures, and the operationalized criteria of response and nonresponse (or relapse) that are based on a composite index of End-State Functioning (ESF [range, 0-7]) derived from the 7 measures, have been validated in our previous dose-ranging, treatment discontinuation, and retreatment studies with imipramine.1,5,15,18 Briefly, these consist of a clinician-rated 5-point global assessment of severity scale and a 9-point scale of self-rating of severity of phobias. Clinical measures of agoraphobic fears include the agoraphobia subscale of the Fear Questionnaire19 and an individualized clinical measure of phobic anxiety and avoidance consisting of the mean rating of each patient's 5 most feared situations on a 9-point scale. Also included is a behavioral assessment test to obtain a functional in vivo measure of phobic anxiety (range, 0-8). Patients kept panic diaries, using the DSM-III20 definition of panic attacks, for 2-week periods at each major assessment period. The 2 operationalized panic outcome measures included in the ESF consist of patient-rated (0-8) and clinician-rated (0-4) scales relating to frequency and severity of individual panic attacks during the previous 2 weeks to determine an overall severity rating of panic. In this context, frequency of panic attacks is presented merely to describe the state of remission and relapse. Patients who met response criteria, ie, either 50% or more improvement from pretreatment scores or a cutoff score signifying mild to absent symptoms simultaneously on 6 or all of these measures (ESF score ≥6), were identified as responders during the open phase of treatment. In this study, an ESF score of 4 or lower signified at least a 33% decline in ESF, and defined "worsening" at any given assessment. A definition of relapse, at which time patients exited the study, also required that worsening be accompanied by insistent requests for therapeutic action, and/or that worsening still be present in a repeated, confirmatory assessment 2 weeks later. The Kaplan-Meier product limit method was used to estimate, and the Mantel-Cox method to compare, 12-month survival curves for 3 outcomes—relapse, worsening (relapse + worsening) as a more sensitive criterion of nonremitted state, and exiting (relapse + drop-outs) as a worst-case outcome scenario. These events were anchored to the 6 major assessment times: for drop-outs it was their last available assessment and for worsening and relapse it was the assessment at the end of the 2-month interval in which they were identified and exited. The proportional hazard model was used to investigate 10 additional factors as potential predictors of outcome. These included age at initial onset, duration of illness, past drug treatment for panic/agoraphobia, comorbidity with any other anxiety disorder, overall disability, severity of agoraphobia and number of panic attacks at initial contact, actual imipramine dose, tricyclic plasma concentrations during acute-phase treatment, and early response (by week 8) to acute-phase treatment. For between-group comparisons, t tests, analysis of variance, and the χ2 test were used, and paired t tests or repeated-measures analysis of variance were used for within-group changes. For all tests performed, the significance level was set at .05, 2 tailed. Sample characteristics, including demographic and clinical variables, open-phase treatment parameters, and severity of major outcome measures at the time of randomization, were not found to be significantly different between experimental groups (Table 1). Analysis of plasma levels available from month 2 up to the point of exiting or completing the study revealed no tricyclic concentration in any patient assigned to placebo with 2 exceptions, both of whom exited the study owing to relapse, one at month 4 and the other at month 2. The traces of apparent tricyclics were ascribed to concurrent medications, namely, cyclobenzapine hydrochloride and hydroxyzine hydrochloride, respectively. In patients assigned to imipramine maintenance, a paired t test comparing month 0 with the last plasma level available showed no significant differences in total plasma concentration or plasma level/dose ratios. Similarly, repeated-measures analysis of variance in the imipramine maintenance completers did not show a significant effect of time on plasma concentration (grand mean=168.94, SE=42.66) or plasma level/dose ratios (grand mean=0.93, SE=0.22). Both analyses indicate a high degree of pharmacotherapeutic adherence. Thirty patients completed the 12-month study, 20 from the imipramine group and 10 from the placebo group. Two patients (10%) from the imipramine completers and 2 (20%) from the placebo completers experienced transient worsening in the course of treatment. Nine patients exited the study from the imipramine group. One relapsed (associated with clinical depression in the context of an interpersonal crisis at month 3), and 8 patients (28%) dropped out. Three of these dropped out because of noncompliance or difficulty with the blind condition, 1 because of pregnancy, 1 because of wanting to become pregnant, 1 because of complicated grief necessitating outside intervention, 1 because of weight gain, and 1 because of moving away. Seventeen patients exited the study from the placebo group. Ten (37%) relapsed (1 at month 1, 2 at month 2, 3 at month 4, 1 at month 5, 2 at month 6, and 1 at month 8) and 7 (26%) dropped out. Of these, 2 dropped out because of noncompliance or difficulty with the blind condition, 3 because of time constraints, and 1 because of moving away. Finally, 11 patients (7 from the imipramine group and 4 from the placebo group) had a total of 13 additional visits for supportive intervention unrelated to panic/agoraphobia. In most cases, the problems were related to interpersonal, family, or financial difficulties. (Details are available on request from the authors.) It should be noted that only 1 patient manifested worsening at the time of an additional visit, and that all of the dropouts were in stable remission up to their last available assessment, ie, the point of exiting the study. The patient who relapsed from the imipramine group had 2 extra visits around month 2 while still in remission (ESF score=6). The results of the 12-month survival analysis for relapse and exiting are shown in Figure 1. The survival analysis for worsening was very similar, with a 0.51 estimated probability of not worsening for placebo and 0.89 for imipramine (Mantel-Cox test χ21=8.15, P=.004). The survival times without relapse, worsening, and exiting in the imipramine group were estimated at 12, 11, and 10 months, respectively. The corresponding times in the placebo group were 9, 8, and 7 months, respectively. Of the 11 variables included in the proportional hazard model, drug condition was the only significant predictor of relapse; other things being equal, a patient receiving imipramine was 92.5% lower in the hazard rate of relapse than a patient receiving placebo. Drug condition was also the only significant predictor of worsening; a patient receiving imipramine was 84.3% lower in the hazard rate of worsening than a patient receiving placebo. The model using the same set of predictors on the hazard rate of exiting did not fit the data well (model χ211=10.03, P=.53), indicating that other important factors predicting exiting were obviously missing in the current model. Nonetheless, imipramine once again seemed to be the only significant predictor in delaying exiting. The relapse of the 10 patients from the placebo group is characterized in Table 2. It can be seen that this was a partial relapse as reflected by the significantly higher ESF score at the time of relapse compared with pretreatment values, although some measures, most notably panic assessments, had returned to near pretreatment levels. None of the relapsers, however, met diagnostic criteria for major depression at the time of relapse. The results of the present study support the hypothesis that maintenance treatment with a constant dose of imipramine has a significant protective effect against the risk of relapse in patients with panic disorder and agoraphobia who have initially shown good and stable response to the drug. None of the demographic, clinical, or open treatment variables considered in the proportional hazard model disrupted the significant relationship between experimental drug condition and relapse. This increases confidence in attributing the difference in relapse mainly to continued pharmacological exposure to imipramine, the integrity of which was verified by serial plasma drug level determinations. The same findings held when transient worsening was analyzed together with the criterion for relapse. Finally, in the worst-case outcome scenario of exiting (relapse + dropout), drug assignment was also a significant determinant, although dropping out is a complex phenomenon with causal mechanisms that deserve further study. Suffice it to say that patients who dropped out from the study were in remission up to the point of exiting, reasons for dropping out related specifically to safety or tolerability in only 3 cases, and adherence to long-term treatment is likely to be more favorable without blinding and the frequent and time-consuming research evaluations required by this study. The more advanced literature21 on long-term treatment of major depression also shows that most relapses occur within the first 6 months of treatment discontinuation with a cumulative increase of relapse, albeit at a slower rate, for up to at least 2 years.23 Relapse after 6 months of treatment discontinuation has been reported in naturalistic follow-up studies of panic disorder,2,3 but occurred in only 1 patient in the present study. If the trend of diminished risk of relapse with the passage of time observed in depression applies to panic disorder, then the magnitude of late relapses in this disorder should be minimal, given that no relapses occurred in the last 4 months of the present study. The speculation merits further empirical scrutiny because it implies that the vigilant monitoring phase required after treatment stops need not exceed 6 months in most cases. However, if late relapses are found to increase the cumulative risk substantially, then the implications based on this 1-year study will obviously require revision. The total relapse rate of 37% within the first year of imipramine discontinuation underscores the clinical dilemma between maintenance treatment, with the knowledge that this would be unnecessary treatment in approximately 3 of 5 cases, and discontinuation of treatment, with the expectation of relapse in approximately 2 of 5 patients. In an earlier study of panic disorder with agoraphobia, we found a significant decrease in the risk of relapse within 3 to 6 months of imipramine discontinuation after 18 months of acute/continuation plus maintenance treatment, as compared with discontinuation after only 6 months of successful acute/continuation treatment.24 In another study, we found that retreatment of patients with panic disorder and agoraphobia who relapse with the same dose and duration of imipramine as in their initial treatment restored the remitted state every time.18 The individual patient's decision may be aided by the information that long-term treatment has protective effects that extend beyond the maintenance phase of treatment and that retreatment in the event of relapse is effective. Our study should not be interpreted as an 18-month effectiveness/outcome study of imipramine treatment of panic disorders in clinical practice. A method was adopted that diminished diagnostic heterogeneity and sacrificed flexibility during the open phase to select a uniformly treated sample of patients with panic disorder and agoraphobia who were in stable remission, did not require additional treatment for panic disorder or agoraphobia, and tolerated the drug extremely well. It is quite plausible to suggest that, under similar conditions, the present maintenance/discontinuation findings would generalize to all antidepressants that share common active mechanisms with imipramine in treating panic disorders. However, because the specificity of imipramine's effects in panic disorder seems to be more robust in the presence of agoraphobia,25 caution needs to be exercised in generalizing from the present imipramine and placebo differences to patients with less fully developed and usually less-severe syndromal forms of the disorder. Finally and most certainly, no effort should be made to generalize the present findings to partial treatment responders, those disturbed by drug side effects, or patients with concurrent or recurrent comorbid depression. We did not observe clinically significant drug withdrawal effects in the process of placebo substitution, probably because imipramine was tapered off gradually in this study. It is quite possible, however, that patients could tell the difference between imipramine and placebo, especially with the long experience of the open phase. These considerations are unlikely to account for the findings in a major way because only 1 relapse occurred at month 1 and relapses were not disproportionately concentrated in the first 2 months, when the presumed effect of these factors would have been at their maximum. The possibility that patients could tell the difference between placebo and imipramine conditions, however, raises the general and common methodological limitation of pharmacological trials without active placebo. Another potential limitation of the study to be considered may be the tacit use of benzodiazepines as an explanation of the relatively low relapse rates in the study. This is unlikely for several reasons. First, the use of benzodiazepines was legitimized in the open phase of the treatment, with the research team prescribing and monitoring their use. Second, all randomized patients, including those who started open treatment while using benzodiazepines, were satisfied with their remission and appreciative of the fact that they did not need any additional treatment, including benzodiazepines. Third, the research team was available and responsive to any complaints of worsening or the need for additional treatments and a close alliance had been established whereby patients accurately realized that their clinical welfare took precedence over the completion of the study. We do not think that subjects in the study had any incentive to hide the need for or use of benzodiazepines or any other treatment for psychological or psychiatric problems. In closing, the finding that relapse occurs in less than half of the patients discontinuing the treatment underscores the importance of the search for reliable predictors of relapse. None of the 10 additional variables tested, including duration of illness, initial severity of condition (particularly agoraphobia), and concurrent anxiety disorders that have been traditionally associated with poor outcome, were found to significantly predict relapse; ie, in this study, relapse was primarily attributable to treatment discontinuation. We plan to study subject-related predictors of relapse more specifically and comprehensively when we have a larger sample of relapsers to work with. In the meantime, it would make clinical sense to expect greater risk of relapse in patients with well-documented previous relapses or comorbid depression. It is also likely that partial responders will experience reversals more frequently when treatment is stopped, but in such cases the primary clinical task would be to provide fuller response with augmentation and combined treatment strategies. These very important issues are also very different from the question of maintenance/discontinuation that pertains specifically to treatment responders. Accepted for publication June 3, 1999. This study was supported by grant MH42730 from the National Institute of Mental Health, Rockville, Md. We acknowledge the assistance of Shenyang Guo, PhD, for statistical consultation and analysis. Reprints: Matig Mavissakalian, MD, Anxiety Disorders Program, University Hospitals of Cleveland, 11100 Euclid Ave, Cleveland, OH 44106.